Hello there and welcome to day one of the Clearly Besotted Stamps Teasers. All the new products will be available in the shop at 10pm on the 5th of March. 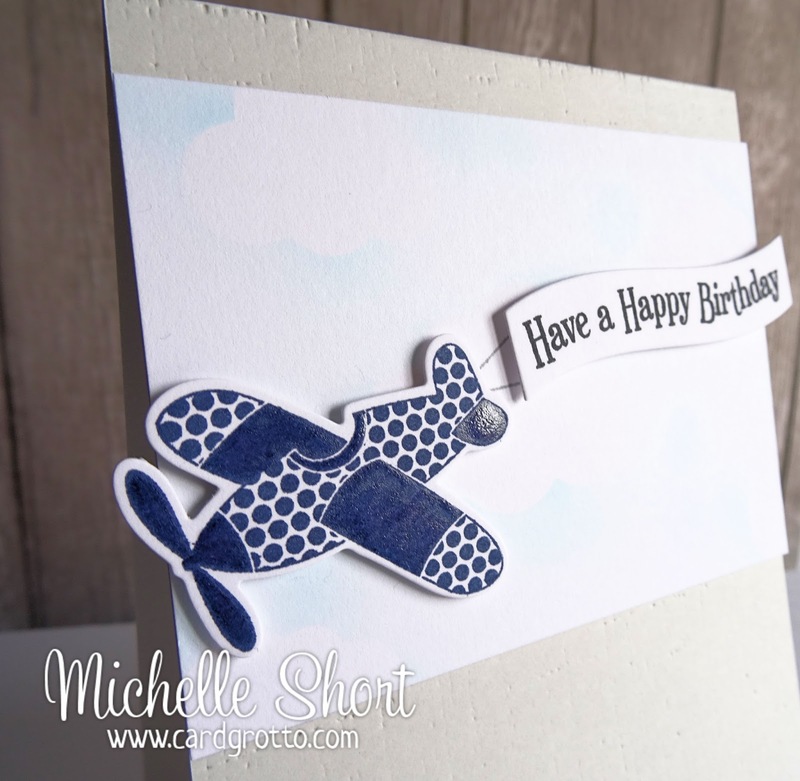 For my first teaser I am sharing with you the new Take Flight stamp set and matching dies. It is a great set, especially for male cards. I have used one of the plane images, stamped it out using Navy ink and then die cut it out. I have added Sakura Glaze pen to the solid parts (which is coming up a little strange in the photos!). I have then die cut the banner and stamped the 'have a happy birthday' sentiment on it. For the base I have taken a sheet of white CS and then die cut the clouds from the already released Sky's The Limit Die Collection from mask paper. These have been stuck on the panel and then I have gone over all of it with the Copic Airbrush System (I haven't used this in about a year!) using the B000 marker. This has been added to a PTI Soft Stone CS base that has been run through my Cuttlebug using the PTI Linen Impression plate. Thank you so much for visiting me today. For links to the rest of my Design Teamies who are sharing creations today, please pop over to Stephanie's Blog. I also would like to welcome Guest Designers for this month, the amazing Jo Nevill and Lucy Abrams. See you tomorrow! This is fabulous Michelle. I love the image and such a great way to add the sentiment. The sky and textured background look so effective. 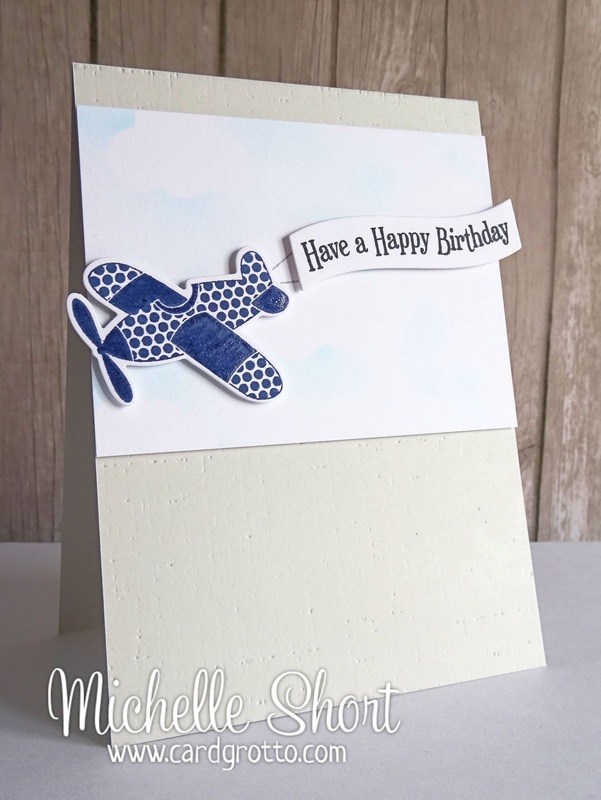 Michelle, your card is absolutely adorable; you've showcased the sweet little plane perfectly! Delightful and fun! Cute card - the sky and clouds are very subtle in this! I love your card, Michelle! The airplane is so cool with your banner, and your soft clouds in the background are the perfect touch! I love the linen impression plate on your card base, too! Lovely card design. That cute plane looks great in navy against the soft clouds. Not sure where my comment went but here I am again anyway!! 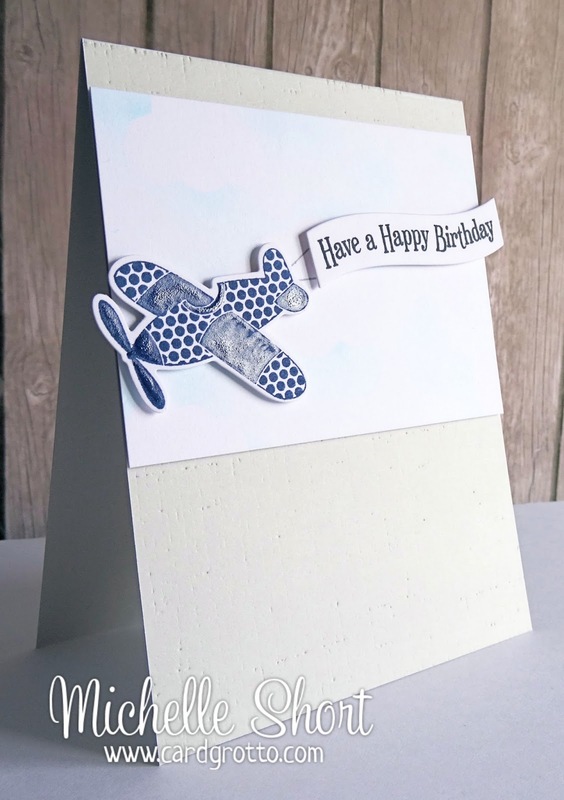 Love the way your banner and plane go off the edges - fab clean card! Thank you for your inspiration! I was able to make a similar card for my little nephew.